Abuja, Nigeria. 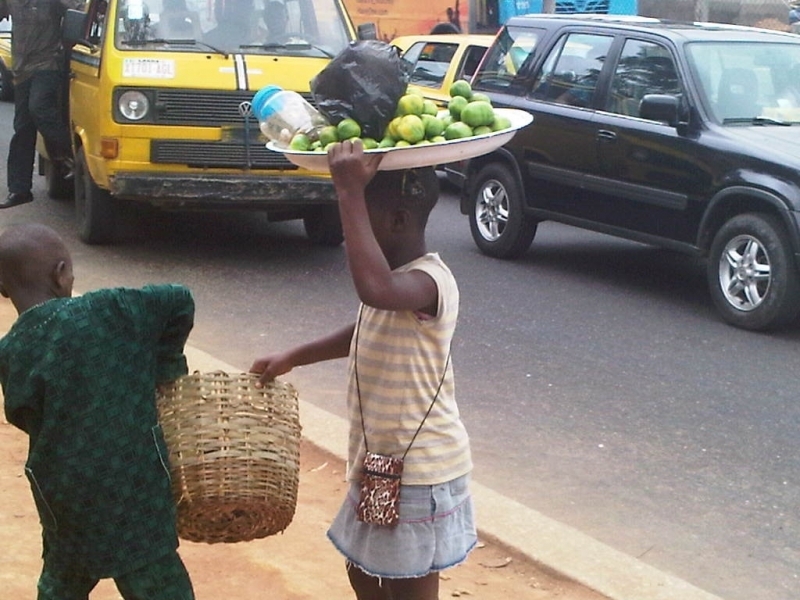 November 12th, 2013 – Special Edition Poll results released by NOIPolls Limited has revealed that 8 in 10 Nigerians (80%) indicated there is a high prevalence of child labour in Nigeria and the majority (86%) confirmed they usually see children engaged in physical labour and jobs in their localities. Furthermore, the vast majority of the respondents (72%) blamed poverty as the root cause for the high prevalence of child labour/slavery in Nigeria. 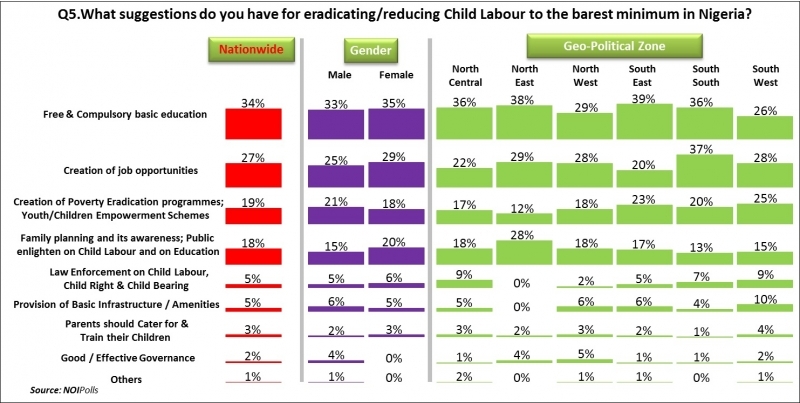 The key suggestions that emerged from the poll to eradicate child labour in Nigeria were “Free and compulsory basic education” (34%); “Creation of more job opportunities”(27%); as well as the “Creation of poverty eradication programmes and youth empowerment schemes” (19%) to generally improve the livelihoods of Nigerians which will in turn reduce the reliance on child labour for survival. These were the key findings from the Child Labour Special Edition Poll conducted in the week of November 4th 2013. The International Labour Organization (ILO) defined child labour as “Work that deprives children of their childhood, their potential and their dignity, and that is harmful to physical and mental development”. This refers to work that is mentally, physically, socially or morally dangerous and harmful to children; interferes with their schooling by; depriving them of the opportunity to attend school; obliging them to leave school prematurely; or requiring them to attempt to combine school attendance with excessively long and heavy work”. The ILO further explains that the most extreme forms of child labour involves children being enslaved, separated from their families, exposed to serious hazards and illnesses and/or left to fend for themselves on the streets of large cities mostly at a very early age. Despite several measures to combat child labour, it continues to remain of great concern in Nigeria. The Nigerian Child's Rights law which took into account the rights guaranteed in the United Nations’ Convention on the Rights of the Child was passed in 2003. 10 years after its incorporation in the Nigerian law, the child labour situation has worsened as millions of children are still engaged in child labour activities. In line with this, the International Labour Organization estimates that about 25% of Nigeria’s 80 million children under the age of 14 are involved in child labour. Also recently the CNN world’s child labour index featured Nigeria amongst the top ten worst countries for child labour. Against this background, NOIPolls conducted its special edition poll on Child labour/slavery in Nigeria to explore the views of Nigerians on the prevalence of the issue, as well as identify the causes and remedies that can help curb the situation. Respondents were asked five specific questions during the course of the poll. Firstly, In order to establish the current state of Child Labour in Nigeria, respondents were asked: In your opinion, how prevalent is the issue of child labour in Nigeria? Findings from this question revealed that the vast majority of respondents (80%) affirmed that there is a high prevalence of child labour in Nigeria. Comparatively, 14% were of the opinion that the issue is moderately prevalent, 5% think it is lowly prevalent while 1% said it is not at all prevalent in Nigeria. Analysis based on geo-political zones revealed that the North-West zone (83%) had the highest number of respondents that said there is a high prevalence of child labour in Nigeria, this is followed by the South-Westzone and the South-East zone with 81% and 80% respectively. In addition, the North-Central zone (19%)had the highest number of respondents that said child labour is moderately prevalent. Secondly, in order to further establish the level of prevalence of child labour in Nigeria, respondents were asked:Personally, do you see children engaged in physical labour or jobs in your locality? Overall, the majority of respondents (86%) confirmed they usually see children engaged in physical labour, while 14%responded negatively indicating they do not see children engaged in physical labours or jobs in their various localities. 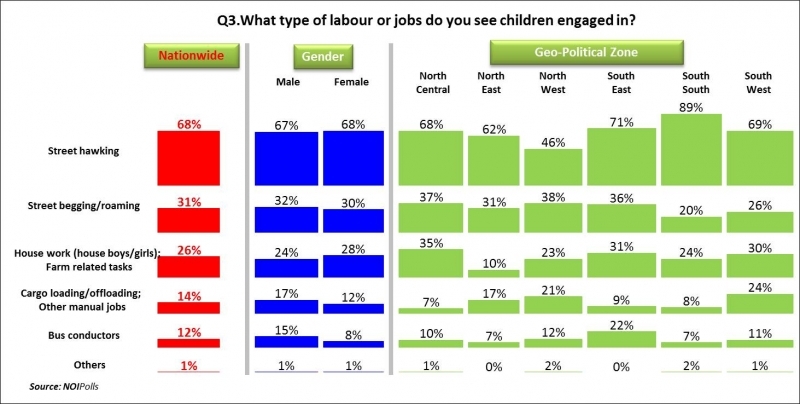 From the geo-political standpoint, the South-South zone (91%) and the South-East zone (90%) had the highest proportion of Nigerians that confirmed they see children engaged in physical labour and jobs in their locality, while the North-East zone (24%) accounts for the highest proportion of respondents that responded negatively. The third question sought to explore the kinds of jobs children are usually engaged in across Nigeria. Respondents who admitted to seeing children engaged in physical labour/jobs (86%) in the previous question were asked: What type of labour or jobs do you see children engaged in? Findings revealed that the most common job that children are usually engaged in is “Street vending” (68%); this is followed by “Street begging/roaming”(31%) and “House work(house boys/girls); and farm related tasks”(26%). Other jobs include include “Cargo loading/offloading and other manual jobs” (14%) and “Bus conductors” (12%). Furthermore, in order to investigate the reasons for the high prevalence of child labour in Nigeria, respondents were asked: In your opinion, what is the main reason for the incidence of child labour in Nigeria?In reaction to this, the vast majority of the respondents (72%) blamed “poverty” as the root cause for the high prevalence of child labour/slavery in Nigeria. Other reasons mentioned include “Illiteracy” (12%), “poor parenting; parental neglect (5%) and 4% blame “poor access/high cost of education”. Furthermore, other suggestions that were given include the “creation of awareness on family planning, child labour and education” indicated by 18%; “law enforcement on child labour, child rights and child bearing” suggested by 5% of the respondents and the provision of basic infrastructure/amenities” suggested by another5%. 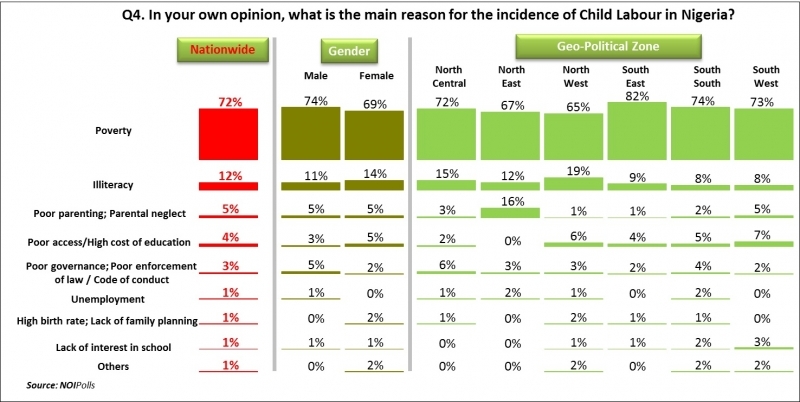 Analysis from the geo-political zones standpoint showed that more Nigerians who are advocating for “free and compulsory basic education” were from the South-East (39%) and the North-East (38%) zones. In addition, the South-South zone (37%) accounts for the highest proportion of respondents that suggested “creation of more job opportunities”, while the South-West zone (25%) had more respondents that advisedthe “creation of poverty eradication programmes; youth empowerment schemes” would help eradicate child labour and slavery in Nigeria. It is key to note that during the survey we recorded quite a number of terminated calls; this was simply because some respondents were afraid that NOIPolls was a regulatory body calling to identify culprits of this social menace. In conclusion, findings from the child labour special edition poll has revealed that the majority of Nigerians (80%) confirmed there is a high prevalence of child labour in Nigeria and the vast majority of the respondents (86%) confirmed they usually see children engaged in physical labour/jobs. Furthermore, the most common type of job which children are usually seen engaged in are “Street hawking” (68%) and “Street begging/roaming” (31%). Additionally, the vast majority of the respondents (72%) blame poverty for the high prevalence of child labour/slavery in Nigeria. In order to reduce the issue to its barest minimum, the majority of respondents (34%) suggested that “free and compulsory basic education” would go a long way in curbing the situation of child labour in Nigeria. Also the “creation of more job opportunities” (27%) and the “creation of poverty eradication programmes; youth empowerment schemes” (19%) to improve the livelihoods of more Nigerians will in turn reduce the reliance on children for the survival. Thus, in the campaign against child labour in Nigeria there's need for a revitalization of all key stakeholders and the adoption of holistic measures that would take into account the root causes of child labour. Furthermore, we recommend an increased commitment by policy makers and stakeholders to eradicating the issue of child labour in our society. Also, their strategies to combating this menace should be aligned with those of international organisations such as UNICEF, ILO who have consistently shown keen commitment to combating child labour all over the world.